All building projects require some form of approval. What types of approvals will be required for your new home and how do you ensure the process is as painless as possible? A development approval assesses the shape, size and form of the new home and it is your designer’s responsibility to ensure all requirements have been met prior to submission. A development approval is often submitted directly to Council however there are exceptions. When living in a body corporate estate your development application is often made to a separate committee independent of Council. These committees have a detailed outline of planning requirements specific to that development. It is recommended to have your designer design within these constraints to ensure the approval process is as painless as possible. It is much easier to conform to the planning controls when your home is designed from scratch versus a templated project home. I find many project builders try to force their pre-designed homes onto a site without a proper understanding of the planning controls applicable for the site, with a reluctance to modify their designs to accommodate. This reluctance is often met with multiple rejections and a need for multiple resubmissions and additional costs. Many states allow for self-assessable applications. These are assessed by building certifiers on behalf of the Council. Building certifiers are accredited building professionals responsible for assessing your building plans against the relevant building codes. Contact your local council (or conduct a website property search) to confirm if your site falls under this category. Before submitting your project for Development Application approval, I would suggest a preliminary meeting with the individual or committee that would be responsible for assessing your application. This will help raise any issues and avoid any unwanted surprises after the application has been submitted. I often see clients and builders try to build things that are either not on the approved plans and/or are not in accordance with the planning controls for the estate, for example, retaining walls. This often does not go unnoticed and could create many headaches after you have moved into your home. If it’s not on the approved set of plans, don’t build it, obtain approval first. Once you have obtained your planning approval your designer will assist you with obtaining a building approval. This approval is required to ensure the design is in accordance with the Building Code of Australia and addresses issues such adequate natural light, ventilation, insulation and structural integrity. This approval was formerly assessed by a department within Council, but can now be processed by an independent building certifier. 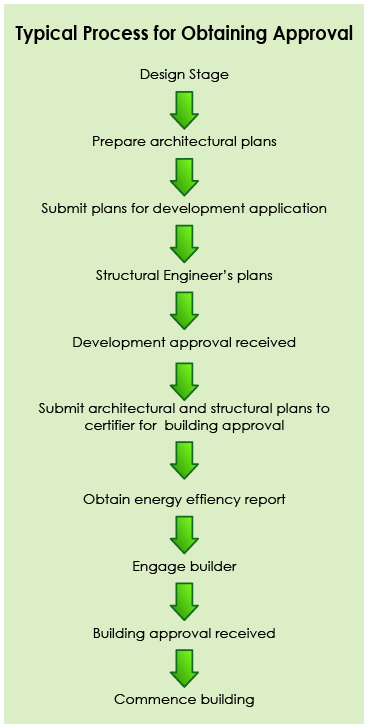 Once both a development and building approval have been obtained, and a builder has been selected, the building process can begin. The building certifier is also required to conduct independent inspections, typically at frame stage and completion to ensure the project has been completed in accordance with the approved documents. Consult with your design professional to ensure you have all the essential approvals in place prior to construction. Ensure your builder has a copy of all approvals for reference during construction. If changes or amendments are to be made, check with your designer and building certifier to confirm compliance prior to proceeding, to avoid future non-compliance issues.